2012 was an eventful year at Thinking Person's Guide to Autism: Our book drew much acclaim, three new editors joined our team, we featured more than 30 profiles of Autistic kids and adults for April's Slice of Life series, we went to the International Meeting for Autism Research in Toronto, our Facebook community hit and surpassed 10,000 members while remaining a nexus for thoughtful autism news and conversation, and we were cited and our editors were interviewed frequently -- especially whenever autism made headlines. We also continued to publish thought-provoking and educational essays and interviews on this site, and all enjoyed and learned from the ensuing discussions. 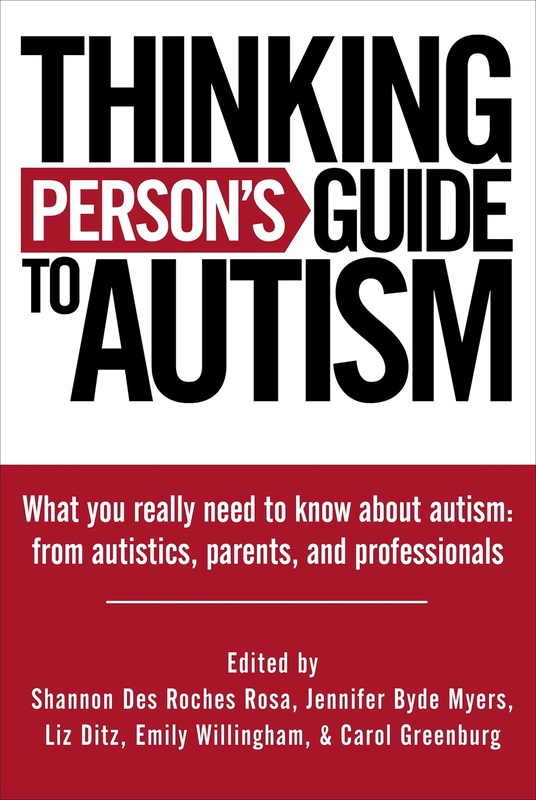 The 15 TPGA posts (with excerpts) below were 2012's most popular -- meaning hotly debated and/or praised -- and give a sense of what we in the Thinking Person's Guide to Autism community had on our minds these past twelve months. Thank you for reading and being part of the TPGA community. We wish you well, and hope you get to define your own happiness in the new year. "With the appearance of “chemical castration” or fatal chelation, one would think that we’ve already hit the nadir of experimental “curatives” for autism, but there’s yet another, lower point. Now we have a cadre of three people who seem to have determined that autism is The Next Big Thing for their “curative” of choice, a solution that is essentially industrial-strength bleach. This year’s AutismOne conference featured a presenter who told the audience that she has directed parents to use bleach in the bodies of autistic children. "Before you read on, I have to warn you that what I describe here is child abuse and tantamount to torture of autistic children. It is harrowing and horrifying." "Karla and I [Cynthia Arnold] would like to get these types of programs rolling all over the United States. We know so many adults who can just walk though program buildings and tell you the simplest things that can be unintentionally hurtful to students." "'...the Golden Hat Foundation doesn't just raise awareness about autism, but it's proof of what happens when determined moms band together to create change.' [co-founder] Margret talked about the terrible feeling she used to have, of not being able to help her own child; and how important it is for people to understand that non-speaking Autistic people can be capable, can contribute to society." "Grieving and ASD Symptoms: The thing that probably helped me more than any other thing during my struggles was the realization that what was happening to me was sensory processing failure versus just going insane. Once I had this information, it became reasonably easy to understand what to do and I was able to focus on symptom management. You see, every brain only has so much space in which to process information, and if a very large part of that is consumed with emotions, it can easily result in failures of other areas"
"Fox TV's new Kiefer Sutherland series Touch premieres in two days, on Wednesday January 25th. We're intrigued, and watchful. The series revolves around a non-verbal child, Jake, who understands numerical patterns other people can't perceive -- and his father Martin's attempts to understand not only what Jake is trying to communicate, but Jake himself." "They say that what doesn’t kill you, makes you stronger. If so, we are forged of steel and iron. We can deal with whatever life throws at us, we are used to managing on our own, but dammit, it is so hard sometimes. It is so hard trying and pretending and figuring things out all the time. It takes years of effort to understand, logically if not emotionally, that we are not stupid, we are not invalid, we have just as much a right to be accepted and loved as anyone else." "Autistics are subject to invasive care and conditions favoring sexual abuse. The best example of abuse in France is Le Packing, a barbaric practice which consists of wrapping autistic children, naked or stripped to their underwear, in cold wet sheets (at 50°F, 10°C), like mummies. Some teams even put the sheets in the refrigerator before using them. (Read a detailed description and critique of Le Packing at Support the Wall.) Today, in 2012, this technique is still used in 300 establishments in France. Le packing has been used on children with autism for over thirty years despite having never been subjected to any evaluation other than a few adult case studies." "Planned, social violence is not a feature of autism. Indeed, autistic people are far more likely to have violence done against them than to do violence to others. No one knows as of this writing what drove the Connecticut shooter to kill 20 children and 7 adults, point blank, although obvious candidates are rage, hate, a huge grudge against humanity, and some triggering event. But if he turns out to have been someone on the spectrum, I'd like to remind everyone that autism is not an explanatory factor in his actions. And that autistic people like my son are fully, fully capable of empathizing with those who were the target of them." "Of course Autistic people are capable of committing violent crime, but it is in no way a reflection of their identity any more than when Jews, Blacks, or Muslims commit violent crimes. The neurology of an accused criminal defendant generally has little to do with the actual meat of the accusation and everything to do with ableist attitudes and legal defense strategies." "It's important to remember that these changes are not new news. They've been in process for the past four years, and these guideline changes have been posted publicly for the past 18 months. What has happened is that Dr. Fred Volkmar, who used to be on the committee but left the working group, decided to do a study to see how many kids diagnosed under the old criteria would meet the criteria for the new Autism Spectrum Disorder diagnostic category. His study concluded that some of the kids who previously were diagnosed with PDD-NOS and Asperger Disorder would no longer meet the criteria for Autism Spectrum Disorder. The working group that is developing the new criteria felt that [Volkmar's] study did not take into account that a good diagnostician, a good Clinical Psychologist for instance, would look carefully at the child in light of the new criteria, and then diagnose appropriately." "The most important part of Autism Acceptance for me, however, is understanding that Leo is not an empty shell, or a changeling. There is not some alternate Leo trapped inside his body, waiting to escape. Leo is here, right in front of me. Leo is Leo. He is the person he was born to be. He is his own awesome self. "I accept and adore Leo just as he is." "Leo's visit was a huge success, and Disneyland turned out to his Land of Yes. He got to do exactly what he wanted all day long, directing the action according to his interests and impulses -- an unprecedented freedom for a boy with a heavily structured life. He was also never bored, which can be an issue for people with communication challenges. Because of a Guest Assistance Card the Mouse thoughtfully provides for people whose wiring or needs makes it hard to wait in lines, Leo could get right back on any ride he liked, as many times as he wanted. (That pass also made him a hero in the eyes of his little sister Mali and eight-year-old cousin Christie, who got to tag along on all those instant-repeat rides.)" "We know pediatricians are overwhelmed by lack of information about autism and autism therapies. We encourage the AAP to partner with adult autistics, parents, and autism professionals, like occupational therapists, to consider the whole child, not just individual therapies. The pain, emotions, parenting issues, and risks of treating sensory as behavioral are too real. We need more from our the AAP and our pediatricians. " "I have been taking vacation time to attend Autism related conferences in an effort to expand my knowledge of the “autism profession.” This is a world that is uncomfortable for me at best and downright hostile at worst. Don’t get me wrong. I realize that these professionals are trying to do well. I know they have good intentions. But just after my promotion, I was literally brought to tears in one of the events. This is amazing because I am so strong. I fear today for those who are not so strong." 15) "Don't let your children grow up in a world where society devalues their lives." "The truth is that we, Autistic adults, youth, and children, need you. We need you to support us. We need you to love us. We need you to listen to us, and to believe that whatever we have to say, write, sign, draw, or communicate in any other way is of vital importance whether or not you agree with it. "Without your help and love, we might not make it in the world as adults."